In January of this year while presenting a the Maine Bar Association Mid-Year Meeting, I had the distinct pleasure of meeting Nicole Bradick, the founder and President of Custom Counsel, LLC. What struck me about what Nicole is doing is it represents a 100% win for solos. There is absolutely no downside. Truly, a 100% win for all those involved and that is our favorite model here at Solo Practice University. Nicole has created a network of practicing solo and small firm lawyers who need other experienced lawyers to help them on a per diem or project basis while each can (and usually) are creating and building their own solo practices. Listen to our chat and you’ll understand why I’m so enthused. The audio is about 30 minutes. Listen directly below. 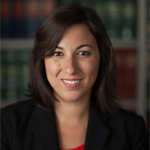 Custom Counsel founder and President, Nicole L. Bradick, is a litigator and mother of two young children. Bradick started Custom Counsel in order to provide a flexible alternative to traditional law practice models for attorneys seeking greater work-life balance. In addition, Bradick recognized a need, particularly in a down economy, for freelance attorneys to provide lower cost legal services to the legal community at large. Custom Counsel attorneys work hand in hand with practitioners who are seeking contract legal services in a symbiotic relationship that benefits everyone involved — clients, hiring attorneys, and freelance attorneys who themselves may be building their own solo/small firm practices. Great interview featuring a great business. I can see why you really liked this Susan. This is a much needed service in today’s legal market.